The Roland R8 was released around 1989, and to this day it remains one of the best drum machines ever made. 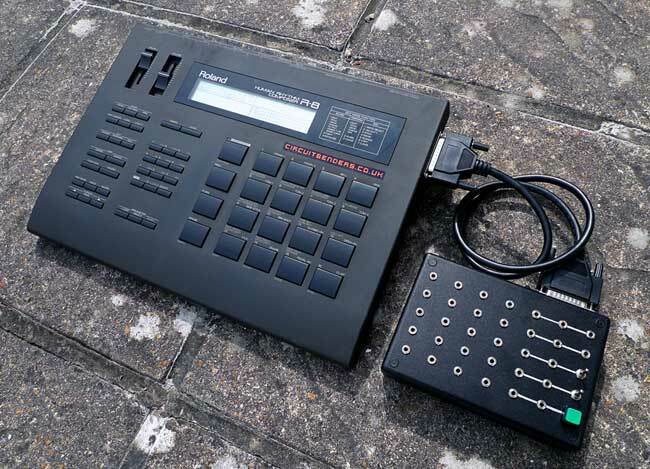 Yes, there are drum machine with more sounds, or more controls, or more complex sound editing, or any number of other features, but few drum machines come even close in terms of being a incredibly solid professional percussion tool. If you want loads of esoteric gimmicks you'll never use, look elsewhere. If you want a tool that will get the job done in as complex a manner as you need it to, and with an astonishingly realistic human feel quantize, get an R8. Even 24 years after is was first made, the R8 can still be found in plenty of professional studios. Theres plenty of details of the R8 on the net so we're not going to go through all the specs here. Take a look at the Vintage Synth Explorer R8 PAGE for a brief run down, or THIS PAGE for some obsessive stalker levels of specs. Theres no room for any decent mods inside the casing of the R8, so as you can see we've connected an extra case to the side via a 25 way D-sub cable, and mounted a patchbay in it. 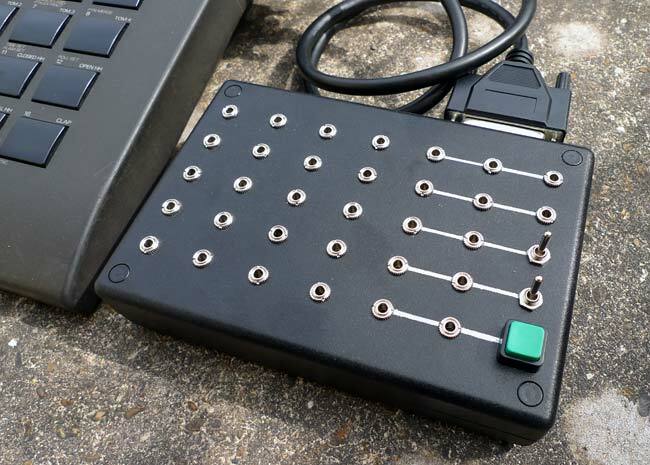 It would also be entirely possible to use a bank of switches instead of the patchbay. 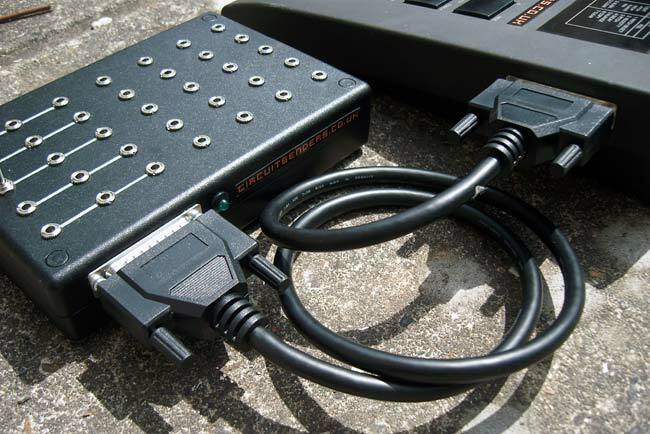 When the external patch box is disconnected, or if you have no patch cables in the sockets, the R8 functions as a normal machine. The patchbay mods consist of a 20 way main patching area, 2 x patching multiples, 2 x patchable switches and 1 x patchable momentary button. 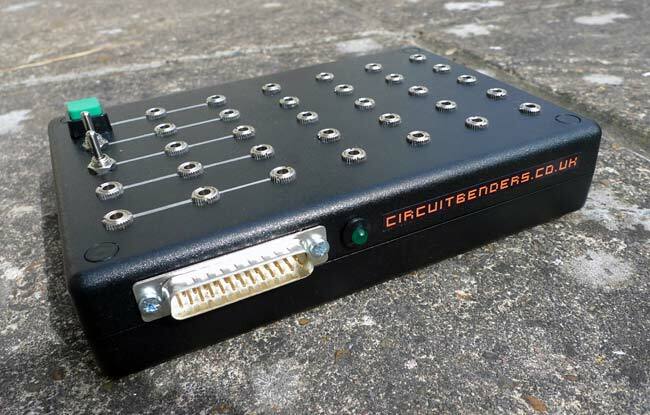 More details of our patchbay mods can be found HERE. The modded R8 is very keen on brutally savage, but also sometimes strangely beautiful distortion sounds. It also excels at strange digital gurgling and shuddering sequenced effects on the longer sounds such as the cymbals and some snares. The R8 takes a little more work than most circuit bent drum machines as many of the possible patchbay connections will produce variations on distortions rather than the common effects found on similar machines, but with the R8 you find that the patching combinations do produce some interesting and more complex sounds. With most circuit bent drum machines it is easiest to produce a drum loop and then process it with the patchbay, but on the R8 it pays to take the time to produce the bent effects first, and then create a pattern specifically around those sounds. One useful feature of the R8 is the ability to expand the number of sounds using expansion cards. Unlike most drum machines of the same era that allow this, the sounds on the R8 cards are actually useful and very usable. Today the most sought after cards are probably the Dance and Electronic ones, which feature a selection of well recorded TR909 and TR808 sounds. The sounds on the cards are effected by the mods in the same way as the onboard sounds.